I skipped out on ya! My girls had 5 performances of their school musical, Annie JR.
And I helped all week with costumes, hair, and makeup! I will show ya more latter, but I also had an emergency trip to the dentist for a child's filling that fell out, and a few trips to the doctors for my other son who got in a car accident. And during all of this, I was sick! That is the whole truth and nothing but the truth!! Needless to say, I just didn't even worry about posting, so please forgive me. But today I have a quick project we did in my sister's living room. My sister needed another chair or two in her living room. She preferred a large 'chair and a half'. So we started keeping our eyes open. We both spotted this chair at a second hand store, on two separate occasions. It was in really good shape and just a little dirty. 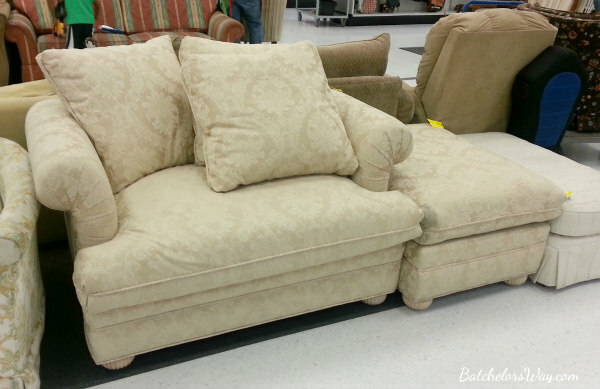 It is very well made, high end, and super comfy. With all that going for it, she bought it for $75 for the both the chair and matching ottoman. Originally she planned on having me recover the whole thing, but she couldn't really decided on material. We toyed with painting it, but our samples didn't turn out well. So we went the super easy route; she had it cleaned and left it!! 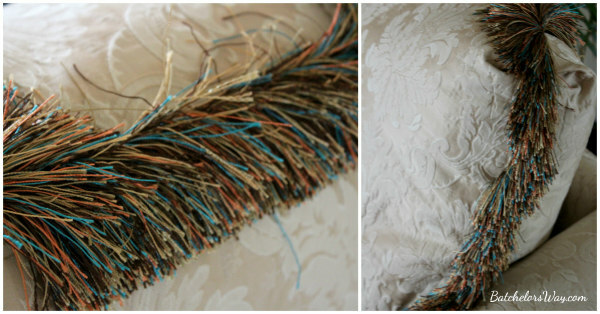 OK, pretty much, the only change we made was to add some colorful fringe to the back cushions. I just unpicked the cushions, pulled out the cording, and inserted the fringe and then had my mom sew it back up. It just gave it some color and life. We were also going to add some giant copper nail head trim, but this furniture had some sort of steal plates in it and every nail we tried to put in just bent. So we nixed the nail head. Eventually she wants to recover the chair and ottoman. But this super easy addition worked great for now!! Who says DIY has to be hard and complicated? You can often find great upscale furniture second hand. Make sure to sit on it and check it out well for a solid foundation. Stay tune to see the whole room come together.